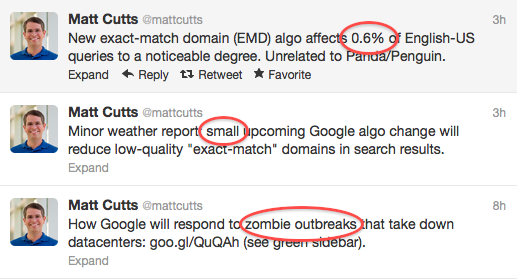 Matt Cutts announced on Twitter that exact match domains are going to be affected by the next “(EMD) algo”. It seems to have some relation to the over-optimization algo change implemented a while back. So are we going to see a dramatic decrease in the use of hyphens? I thinks so… Have you ever tried to give verbalize a domain over the phone when there are 4 hyphens! But I digress. This is just another step in the quality battle that Google is fighting. Oh and apparently they are fighting another battle, Zombie outbreaks. All you people who make zombie infographics are putting server bandwidth to the test. Anyway, the only news I could find so far is the popular tweet by Matt Cutts. Didn’t see anything official on the Google blogs. But I think Cutts is a pretty solid source on this one. This entry was posted in Algorithm Changes by Russell Jensen. Bookmark the permalink.